On Friday, Ed and I traveled down to Bloomington/Normal for food, wine, and fun! After a yummy lunch at a Japanese steakhouse, we wandered around downtown--sorry, "uptown"--Normal. So much has changed, I barely recognized where we were! But Ed's favorite comic book shop is still there, and so is the Garlic Press. It was nice to see that Babbit's Books was moved instead of closed, but I had no desire to go in there. Instead, Julie and I went into a very girly store called Fabulous Affairs, and then we all went for ice cream at a new place called Emack and Bollio's. Yum! Later that day, we headed off to the Shakespeare Festival. It was at the Ewing Manor, which I'd never been to. Gorgeous place! 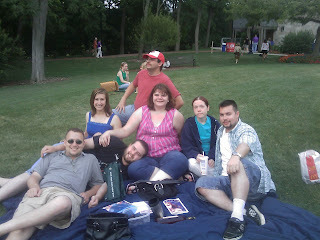 We spread out a blanket on the lawn and had fruit and wine before the show. The play was shown in a theater-in-the-round with no ceiling. The show was called "Scapin", which isn't actually Shakespeare's work, but it was funny. Even Ed, who doesn't usually like plays, laughed a lot. The second act might have been funnier for me because that's when Julie and I finished the bottle of wine . After the show, we went to Carlos O'Kelly's for a late dinner. We had to leave right after breakfast on Saturday so that we could pick up the dogs from my mom's before she went nuts from watching them. All in all, we had a great time! Tonight, I read about how Illinois still does not have a budget. Not only that, but the legislature won't discuss the budget again until July 14. Apparently, this day was chosen after surveying the representatives to determine when they would be available. Without a budget, I have no job. I'm sure something will be worked out by the middle of August, but I would really like to know now if we'll be receiving enough funding to pay me a full-time salary. There are other people who really depend on having a budget. So what really irks me is the two-week gap between now and the next budget meeting because too many representatives are too busy. Elected officials need to make the time to do their job. So what if heated budget discussions, which happen every year at the same time, interfere with family vacation plans? They should have thought about that before running for the state legislature.